ABOUT: The sights of the city are your daily companion throughout this recently renovated home thanks to glorious floor-to-ceiling windows that wrap the space to the north and east. Ten-foot ceilings accentuate the sense of airy weightlessness while French doors allow light to wander unimpeded and new floors gleam underfoot. Arrive in the welcoming foyer and discover an over-sized great room offering plenty of space for living and dining. Eastern light makes the sunny eat-in kitchen the perfect spot for morning coffee while rows of custom cabinets, granite counter tops and new stainless steel appliances make cooking a breeze. The split-bedroom layout positions the master suite at the southern end of the home where you'll find a truly massive walk-in closet and an en suite marble bathroom. The second light-filled bedroom is positioned off the great room, and if not needed as a bedroom, its classic French doors make it ideal for use as a den or formal dining room. This building is located on the corner of West 20th and 6th Ave and has much to offer. Not only does it have storage galore – thanks to its stand-up attic space and walk in closets – but it has amazing natural lighting from all the oversized windows. Complete with a spacious kitchen, master bedroom, and a personal library space, this quiet and sophisticated apartment is one worth checking out. 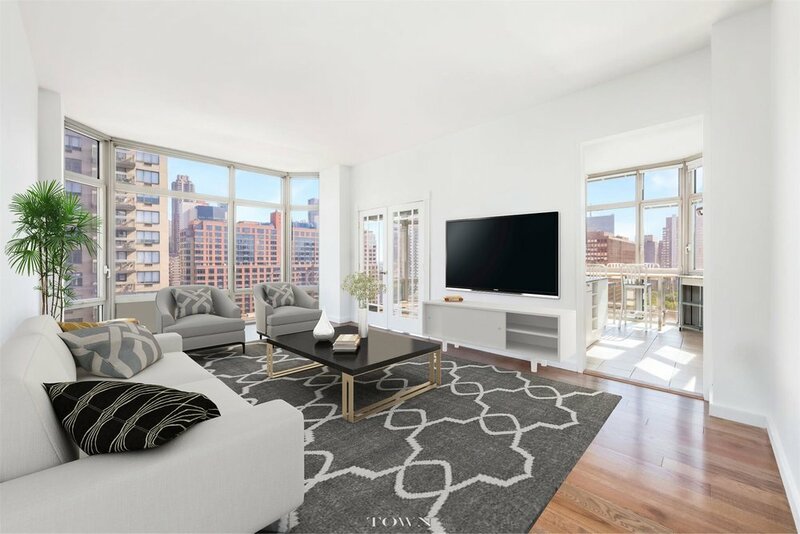 ABOUT: Introducing an impressive east facing split 2 bed, 2 bath with private storage located in one of the most sought-after luxury Condominiums in Soho. 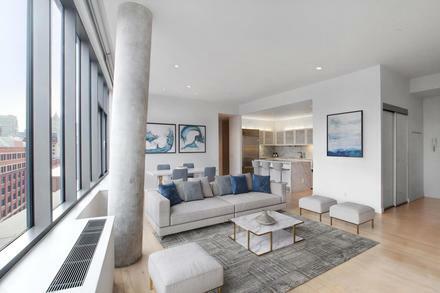 The sense of arrival is amazing into this loft like, shallow bay depth apartment that maximizes the light and is highlighted by incredible proportions, 10' ceilings and unobstructed views from every room to the skyline, Petrosino Square and Williamsburg Bridge. The efficiently laid out home has incredible SF efficiencies and is well-proportioned which provides a nice balance of elegance, comfortable living, dining and entertainment. The home has lots of closet space, a state of the art open kitchen featuring an oversized island, a wine cooler, white Carrera marble countertops and premier stainless appliances. The spa-like bathrooms are equipped with heated tiled floors, marble countertops, an oversized Kohler deep-soaking tubs with dual vanities and separate custom tiled showers in the master bathroom. ABOUT: This open plan 1BR/1BA duplex apartment is located in the heart of Greenwich Village, centrally located to NYU, Washington Square Park, Union Square, SoHo, Greenwich Village, and the West Village, with the best retail and restaurants in all of downtown. This bright apartment is smartly planned out for living indoor and out. The living room features a floor-to-ceiling glass door that opens up to your own balcony, and overlooks the lush green private patio. Discreetly located below the living room is the private master bedroom, that includes a fantastic walk-in closet. The apartment has hardwood floors throughout, and multiple closet spaces, and the open kitchen features Caesarstone counter tops, with stainless steel appliances.